For long I have wanted to do a review for this game. It is one of my favorite games and it’s from my most favorite game designer, Stefan Feld. You would know the game if you’re not a newbie to the hobby. Feld has received many great responses for this game, some even might say that it’s the best game he ever invented. For those who don’t know, Burgundy is a region located in East-Central France. 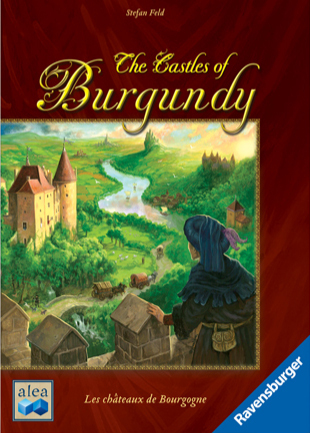 As you can relate the title of the game with the background, you can see that there are lot of castles in Burgundy, in which were built during Middle-ages. In this game, each players will become an Aristocrat who controls an estate of settlements. Players will compete with each other to build the most prestigious estate during the game. 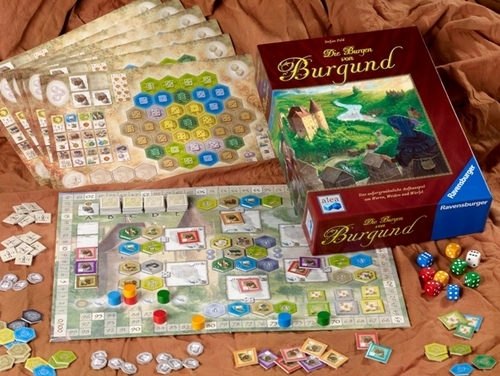 The Castles of Burgundy, while having a theme (Euro style) is really a Euro game with pasted theme. Nothing special here, it’s just you are bla bla bla, controlling bla bla bla, competing with other player in bla bla bla, to get the highest points by the end of the game to win it. So it’s really boiled down to the game play mechanics rather than the theme’s importance in a game. In this game, you will become someone powerful enough with authority and decision to shape the land that’s given to you by building some settlements in such a specific manner that (instantly / eventually) give you prestigious value that will be accumulated as points at the end of the game. And by jolly that someone will become the winner by having the most points and celebrates over the entire land, which I doubt that someone will ever truly do so in real life. That’s why this is just a game. 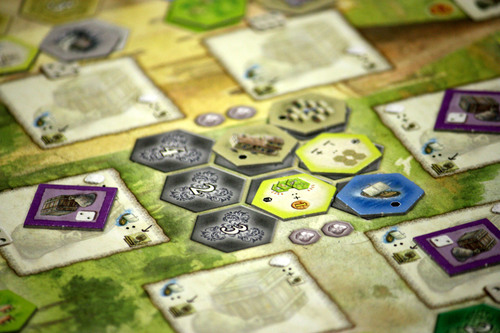 Feld is known to design a game that has lots of lots of components. In this game for example, there are hundreds of tiles in many shapes. Also dice, yes colorful dice. 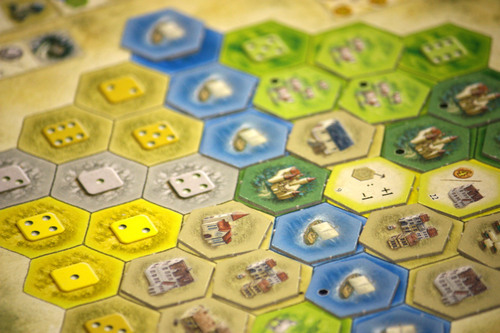 The game comes with a main board and several double-sided player boards (or more likely player mats), settlement tiles in several categories, goods, worker, Silverlings tiles, wooden player markers and also colorful 6-sided dice. In details there are 164 hex tiles, 42 goods tiles, 20 Silverlings tiles, 30 worker tiles, 12 bonus tiles, 4 victory pieces, 8 wooden markers, 9 dice and 6 player boards. Alea published the game with only one flaw, the thin not so good-looking tiles. It would be perfect if they made it with thicker cardboard material and also the player mat should had been perfect if they made it just like the main board. But of course they had considered these things before. Nothing special on this one also, but it’s pretty good as a standard Euro game. Not great nor bad. The artist behind this game is Julien Delval , who also had share a good portion around Euro games’ artworks such as Dominion, Battle Lore, Citadel, Memoir ’44 and other things. The symbol designs are pretty much intuitive and it’s finely made to provide a language independent aspect throughout the game and the components. The game lasts in 5 phases, which there are 5 turns in each phase. 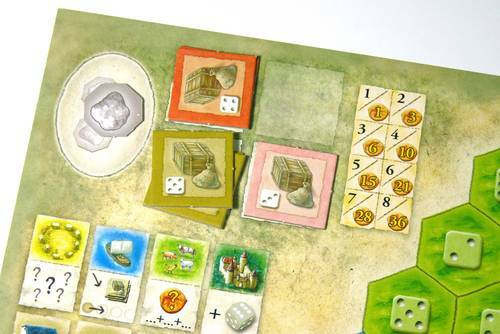 Each player will receive a player board (which can be random or predetermined), 3 random goods, 1 Silverlings, 2 dice of a chosen color, 2 player markers that are placed on the shipping track and VP track, 1 initial Castle tile that players place into one of the dark green slots on his player board (each player chooses which slot he want) and some workers (the first player gets 2 workers, while the next player gets plus one worker more than the previous player consecutively in clockwise order. Place the main board in the center or the table and fill it up with the needed tokens, such as 5 face down goods tiles in each phase slot and randomly draw hex tiles based on the corresponding color slots and number of players listed. And the game is ready to start. At the start of each phase, reveal the current phase’s goods tiles into available slots. 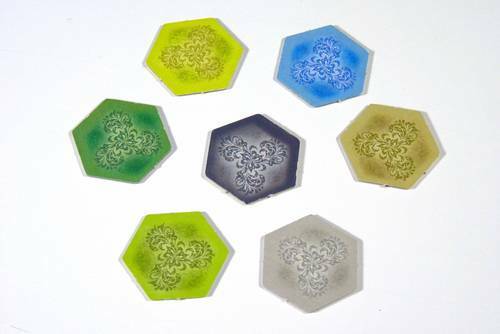 This 5 goods tiles will give players easy sign to mark the current turn of the phase. Next all players roll their dice simultaneously (the first player adds the white die to his roll). After the roll, the first player place the current goods tile to a depot with a corresponding value of the white die (this is important to be remembered by the first player, so he doesn’t forget to place the goods tile into a depot). A mistake is crucial and can make the game 1 turn more or less. Lets take a look at the player board. Each player board, has a space on the right side which is the Estate. This hexagonal shape space is formed by small and colorful hexes with different dice values. 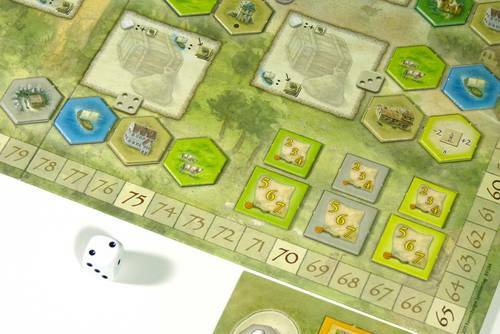 The colors and dice values are important, for they will be used to determine placement of the settlement tiles. There are 6 different colors for the settlement tiles. Those colors are Blue for the Ships, Dark Green for the Castles, Brown for the Buildings, Yellow for the Knowledge, Green for the Animals and Gray for the Mines. These colorful tiles are spread on the Estate, creating regions based on color adjacency. 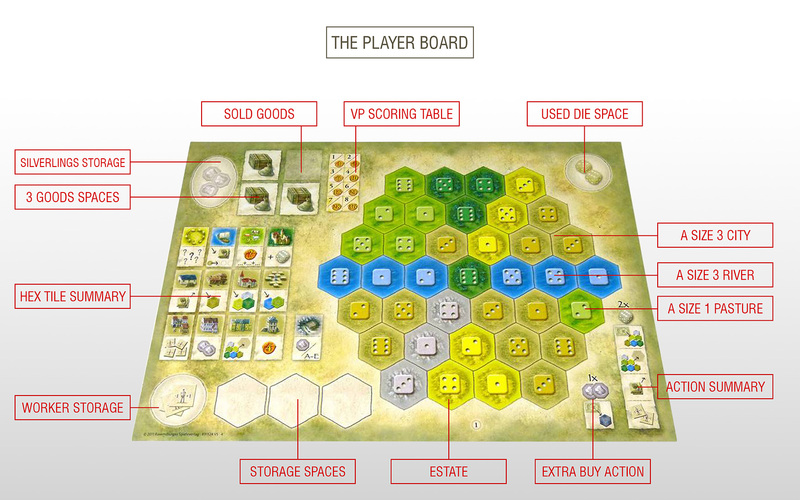 The left side of the player board, you can see brown buildings’ references, scoring chart, space for workers, goods and Silverlings. Meanwhile on the main board, there are 6 depot slots around the central black depot. During preparation process at the start of each phase, these hex spaces on those depots will be filled by randomly drawn tiles based on their colors. 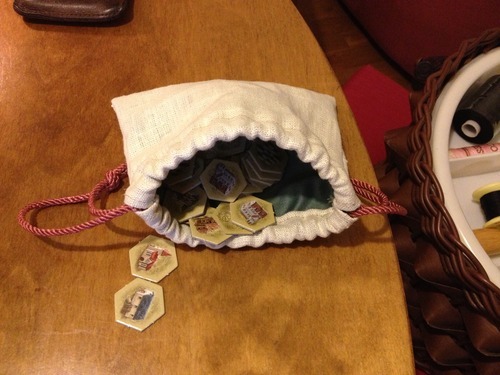 These are the hexes that available for the players to acquire at the current phase. There’s also a shipping track which shows players turn order. At the top and bottom right of the board, there are square spaces for bonus tiles. These bonus tiles are rewarded for players who complete to fully cover a specific type / color on their estate. There are 2 bonus tiles for each type, one for the first player and another one for the second. There are 6 available depots around the central black depot. These depots have die values from 1 to 6. Using one of the player die, that player can take any hex tile available on one of the depot with the same value of that die value, placing it to one of the three available slots on the player board. A player can use this action to place a tile that’s already in his storage spaces into his estate. Note that the restrictions of the placement are based by the type / color of the hex, the pip value on the hex space and it must be adjacent to an existing tile on the estate. Once the tile is placed, the tile effect is triggered if any. There are 3 kind of tiles based on the effect, some tiles are immediately activated once placed, some are for end game scoring and the others give benefits during the course of the game as long as the requirements are met. If placing a tile complete a region (adjacent spaces with the same color), scoring takes place. The scoring values are different based on number of tiles and at what phase the scoring takes place. The more tiles and the earlier phase a player scores, the more points he get. Also when a player places the last settlement of that type / color, he receive the bonus tile (if any). Each player has a warehouse section on his board. The warehouse provides 3 slots for goods, each slot used for a different kind of goods, so a player can only stores up to 3 kind of goods at a time. Players can sell goods to get points and silverlings. There are 6 kind of goods and each kind has a die value. To sell it, players use one of his die which has the same value of his goods. For each tile of goods sold, players get 2/3/4 points in a 2/3/4 player game. And in addition of the points, players also receive 1 silverlings tile from the transaction. The sold goods are placed face down on the sold goods spot. This is the most simple (but often important) action out of the four. You trade die with workers. Each die generates 2 workers no matter the value is. What’s the use of worker? Worker gives you modifier for your dice. 1 worker tile gives you a plus one or minus one to the value of the die. Players can use multiple workers to modify one die value. And yes, it’s possible to modify 6 value to 1 with +1 modifier and 1 value to 6 with -1 modifier. This gives you flexibility against the luck of your dice roll. In addition of the actions mentioned above, players may also spend their silverlings once per turn to get the black / special hex tile on the central depot with the price of 2 silverlings. So what’s the difference between other hex tiles and these black tiles? Well, the black tiles consist of various types of tiles, this provides extra chances for players to get the tiles needed out of the six depots available. A phase ends when the last player had completed his fifth turn of that phase. The depots (the six depots and the central depot) are refreshed (the goods on the depots are stay). The next stack of goods tiles is distributed to the goods slots. All players’ mines generate silverlings. The game ends after the last phase has been completed. 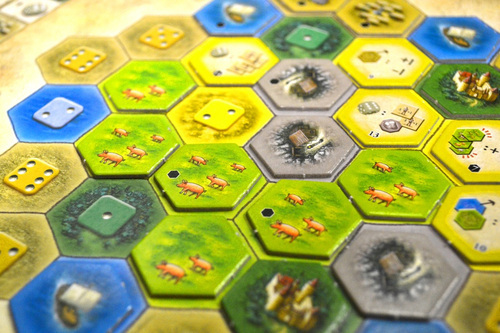 The final scoring takes place, players get points from the end game bonuses from yellow / knowledge tiles, bonus tiles, extra worker tiles (1 point for each 2 workers) and 1 point for each silverlings tile. As you can see, based on the rules of the game play, this game falls right into the medium heavy category Euro games. You need to get familiar with the rules and all the settlement abilities to really understand what to do and plan during the game. At first, if you are not a gamer yourself, you might get overwhelmed by the lots of different types of settlements and specific treatments for them. It’s usual getting lost not knowing what to do during your turn, asking advise from more experienced players should be useful, though it won’t help much because experienced players usually have more wide range strategies that they can choose from. Just like his other games (his signature maybe), Feld made this game with lot of options, many paths to get points, which some might see diversification is the best thing, but don’t get it wrong, as many as you want to diversify, focus just on several not all could be an important key to play the game. Yes they all have potentials for you to get points, but not all can be accomplished in one play, players will need to choose which paths they need to focus on and which path they don’t need to. This is important, the run of the game should force you to make important decisions throughout the game. Whether the tiles you need will ever come out or maybe it’s already taken by someone else. The dice factor really adds some key element, though it’s pretty much random and luck, they provide coverage for your plan. 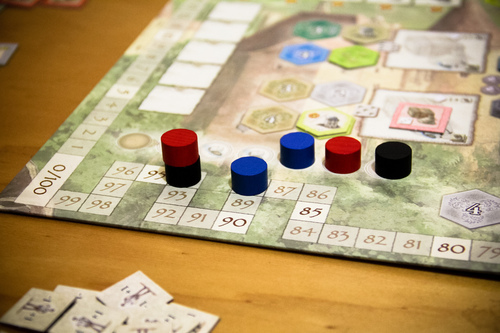 The dice roll determine which action you can take and which you cannot during each turn, and to mitigate the luck factor, Feld added the worker tiles. It’s luck alright but you can still survive bad luck roll with those workers, bless them!During the game players will encounter some pretty interesting combo and combination effect with different kind of tiles and how big difference could be when timing the turn order. After one play, new players could easily understand how the game works and fully enjoy it. Castle is a settlement tile with dark green color with a castle image on it. At the start of the game each player has already own a castle that marks his starting position on his estate. The good thing about castle settlement is the free action it gives. Immediately after placing a castle tile, the player gets one free action that he must immediately take. This free action can be any one action from the 4 available actions and doesn’t restricted upon any die value. So you can take a tile from any depot, place into any space or sell any type of goods. And there are only 4 Castle spaces on the estate, so it’s not hard to complete to gain the bonus. There are only 3 mine spaces on an estate, the least spaces from any other settlement, but of course it’s also has the least distribution tiles on the main board. Mines main purpose is to generate silverlings at the end of each phase. These silverlings are used by players to buy black tiles or worth 1 point each at the end of the game. Pasture is a settlement with light green color and animals. There are 4 kind of animals in the game, chicken, cows, pigs and sheep. This animals solely purpose is scoring points and points and more points. Each time you place an animal tile on a pasture space you score points based on a number of animal shown on that tile plus points from the previously placed animal tiles with the same type in the same region. So they could be many. Usually you gather them animals of the same type in the same region place tiles with most animals first so they can hopefully score more than once. Knowledge tiles are yellow colored with various images, those images describes the effect of the tiles. There are two kind of effects, the end game scoring effect and the passive continuous effect during the game. Though the images is self explanatory, new players will need some adjustment and time to understand and memorize all of them. Building tiles are brown colored and have different kinds with different images. 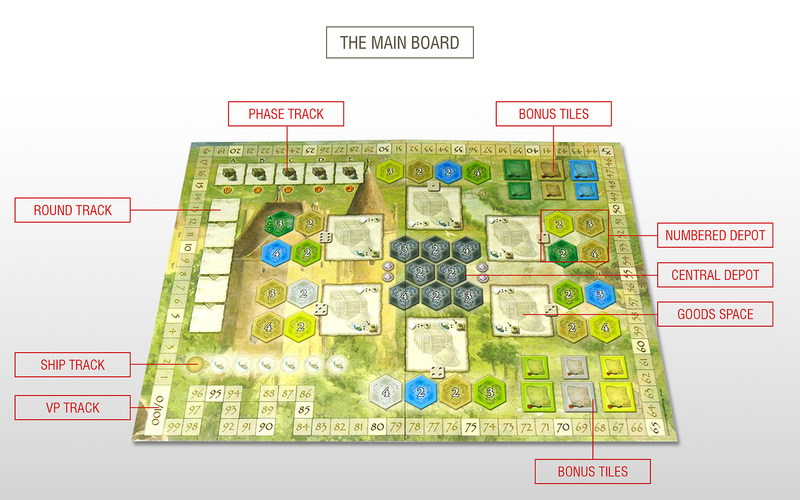 The description of each building is shown on the left side of each player board, and the symbols are also self explanatory. There is a basic restriction for building tile placement, players may not place more than one building of the same type in one region (unless you have a knowledge tile that allows you so). The building effects are surely interesting, there is a building that upon placement let you acquire a specific kind of tile from one of the depot (if available of course). Or a building that upon placement gives you 2 silverlings, or a building that upon placement let you to place any kind of tile from your storage to your estate and many more, I let you find out yourself. You can rest assure that this game offers you high replay value right from the start. The game comes with different player boards that you can try aside from the 4 basic boards for your first game. These other boards have different estate layouts that could give you interesting approach in the game paths you need to take. And also, playing with different number of players doesn’t work the same, since different number of players provide different number of tiles drawn in each phase and points given from selling goods. So basically, the replay value is quite good, playing over and over again is unlikely the same, since you cannot get everything you want in each game. Now let’s get to the bad parts, as you can see there are some aspects why this game is not as good as it should and some might agree or disagree. The awful thing to start this game is the preparation, you know separating and organizing those tiles are painful and unasked for. The game does not come with draw string bags in it, so you need to find at least 4 draw string bags to hold and randomly draw the tiles. And don’t forget to clean up after the game ends has the same painful effect (more I dare to say) since you need to separate those tiles back into the box based on it’s category. Looking on the tile’s thickness, I should say it’s supposed to be thicker than it is, so you can feel the goodness of the tile when picking them up. Not really important but could improve the premium feel of the game components, same thing with the player boards. No doubt that this is one of my favorite games in my collection, my girlfriend likes it. It even works very well with 2 players (quicker I must say). Two experienced players can finish the game in 45 minutes (aside the setup) and 90 minutes for 4 players. This is a game that finds a permanent place on my collection, no way I’m gonna sell it (or no way she gonna let me), it has this awesome feel of building something, some sorts of accomplishment to complete your estate in such a way and yes, you will feel the solitaire game in your estate but of course there is still interaction on the main board. This game is widely known and overly known as the most favorite Feld’s in my group though I am not completely agree with that statement. I still prefer Trajan over Castles of Burgundy by a hair or two. The game is fun, with simple rules and the building theme really fits into gamer and non-gamer alike. New players or casual gamers will find it amusing. The only reason why I picked Trajan over this game is Trajan is heavier game than this game, that has medium weight scale. Not that it’s a bad thing, but I prefer heavy Euro than medium. One to his own.